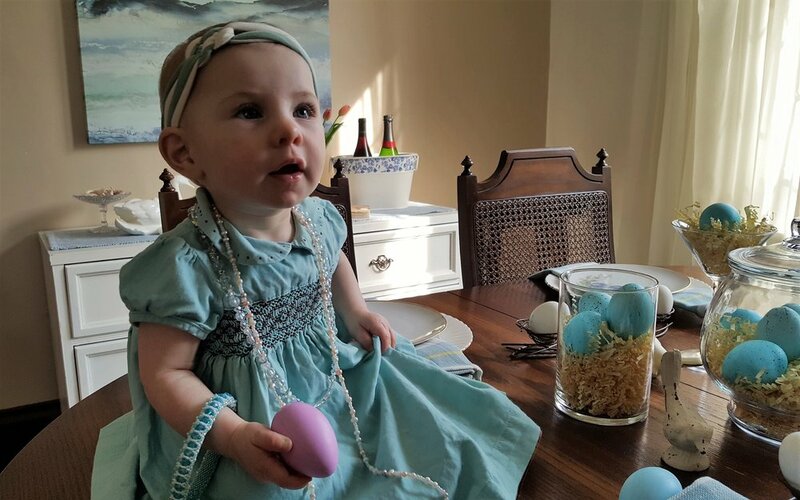 Miss S all dressed in her best for Easter! It's that time of the year. The flowers are poking through the ground, the air is warming and that feeling of fresh and new is everywhere! This weekend, many of us will celebrate Easter...and even if you don't...it still feels like a time of baby bunnies, chicks and lambs. Of innocent eyes opening wide to new sites. And of course, we think about new additions to our wardrobe and to spring table settings. Below, I have some ideas for you, that can be used for your Easter dinner or just lovely spring decor!! If you're looking for some new additions to your wardrobe...look for light pieces you can layer...like "Solitude" necklaces or fun earrings that make you think of spring...like my "Butterfly Wings" Earrings. Another option is a fun, statement piece like my limited edition "April and Babe"...(yes, April the Giraffe!). You can see sweet Miss S here is going with the layering and vibrant spring colours! Are you hosting an Easter dinner this weekend? I'm sure, if you are, that you are looking for options that are easy and lovely! Look to using items from around your home and re-purpose them. I borrowed a glass jar, martini glass and vase to show off my speckled eggs. I used dishes I already had and layered them with some pretty plates with fruit on them. Yes, I was oggling all the very cute "bunny themed" plates out there...however, common sense told me that using lovely plates I already had, made more sense then buying plates to use once a year! I did purchase some new napkins...but as I use cloth all year round (just one of my little ways I try to help the environment)...they will definitely get lots of use! I also purchased a small bundle of tulips for a pop of colour against my blues and browns. I liked the natural look to the wood table...but don't be afraid to use a tablecloth, a runner or...my fav, a light weight blanket!! (they never look wrinkled and I dislike ironing. :) ). I decided on not colouring all of my hard boiled eggs, and used some plain white ones and a brush marker in blue to add names to act as place markers. The speckled eggs I created very quickly (my how to tips are below if you are so inclined) and my little metal "nests" I found at a consignment store. They are so sweet! Speaking of sweet...nothing is so stinking cute as little ones in their Easter finery! Miss S here is so cute in a smocked dress, bare piggy toes poking out, a matching headband and just so much curiosity about each and every thing on the table! Decorating should be fun and an adventure for those doing it as well. I wish all of you a wonderful spring weekend...enjoy every moment and send me photos of your pretty decorating! Using the cheapest kind of egg colouring kit (the plain, original kind)... make up the blue dye bath. I put eggs in for different lengths of time...so they varied a bit from lighter to medium blue. This only took a couple of minutes total. Once pretty much dry...take a bit of dark brown acrylic paint and add a bit of water to it in a small container. Take an old pastry brush (toothbrush works great as well) and dip it in this mix. Press off most of the extra on side and then holding the brush over the eggs, run your finger over bristles to splatter the paint. (if you're careful and have your aim correct...you wont even need painting clothes on! lol) Let dry a minute or 2 and then flip the eggs. (I use an egg carton to dry my eggs...instead of the silly box the kit comes in). Repeat. Check sides to make sure paint splattered there as well...do them if needed. Let dry and decorate away! Necklaces, Bracelets and earrings..oh my! Most of us love to give…especially at Christmas. Sometimes, that giving, is stressful. We want to pick a nice gift, the perfect item for those we love. Something that will make them happy, smile and become something they’ll cherish. That can be hard! Some people just have everything. Or are difficult to please (dare we say!). And sometimes, we end up at a complete loss as to what to give. That is when, looking at a personalized gift is often the answer! My String Beadz has many lovely options that are personized or can be personalized for that gift challenge in your life. Starting with “Family” or “Family in Pearls”…both bracelets…these can be made with the recipients family’s birth months or favourite colour(s). Created with Swarovski crystals or Swarovski crystal pearls….these bracelets are lovely. Give her one in her family birth months and one in her fav colours….and then she can stack them at times. ­Another option is a “Fabulous Fifty” bracelet. While these were designed to celebrate that 50th bday milestone (or 40th or 60th etc), it also makes a perfect personalized gift for that special someone. This charm style bracelet is created with 50 beads hand-picked for the recipient. Charms showcasing her passions, birthstone beads for her and family members, her favourite colours or beads….anything and everything special to her! One of my favs, of my pieces that can be personalized, is my “Corked” Pendants. These necklaces are just so unique and special. First…send me a cork from a special event from the life of the recipient. A wedding, anniversary, retirement dinner…the list goes on. I can add colours and a charm to suit the recipients tastes and loves. A piece that remind the wearer of that special event. Don’t have a cork?...just let me know a winery you’d like the cork to be from, and I’ll do my best to get one. Of course, pretty much every MSB creation can be made to suit the recipient as much as possible. From their favourite colour(s) to a precise size, (that works for them…not manufacture standards), and special details…like an important charm added to a bracelet. Every piece has an opportunity to be “customized”….and working with you on this, is super special. Better yet…work with me to create a custom “one and only” piece for the recipient. Just because it is a “one of a kind”…does not mean you will pay thru the roof prices for that customization. You might just be very pleasantly surprised. So let me know if you’re needing some help with your gift challenges. Working with customers’ on challenges…makes me very happy…and I want to share that happiness. On Sat, I had the pleasure of participating in a Vintage Market, hosted by Vintage 30 and Corner Shop Decor. What a fun...although very hot (thank you breeze!) day! The other vendors had so many lovely vintage pieces...furniture in its original state, furniture revamped with chalk, milk or mineral paints, dishes, items that would have been at home originally in a garage...you name it! But all, I'm sure, could tell quite a story! Some lovely pieces in original state! 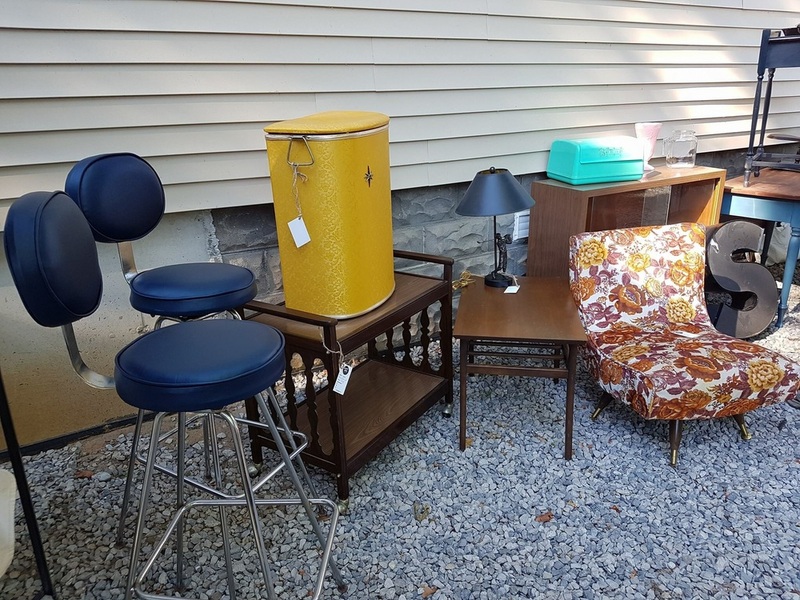 One of the most talked about pieces...at least from my perch...had to be this 60's-70's era hamper in gold with a star on the front. You know the type I mean...everyone's parents or grandparents or aunt had one of these hampers. I heard many tales on Sat about this hamper...until it was scooped up by a happy customer! "The" hamper of many tales! A gorgeous bracelet from vintage earrings. ...of all different styles. Or fix the back, so they can still be earrings...but with modern ear wires. 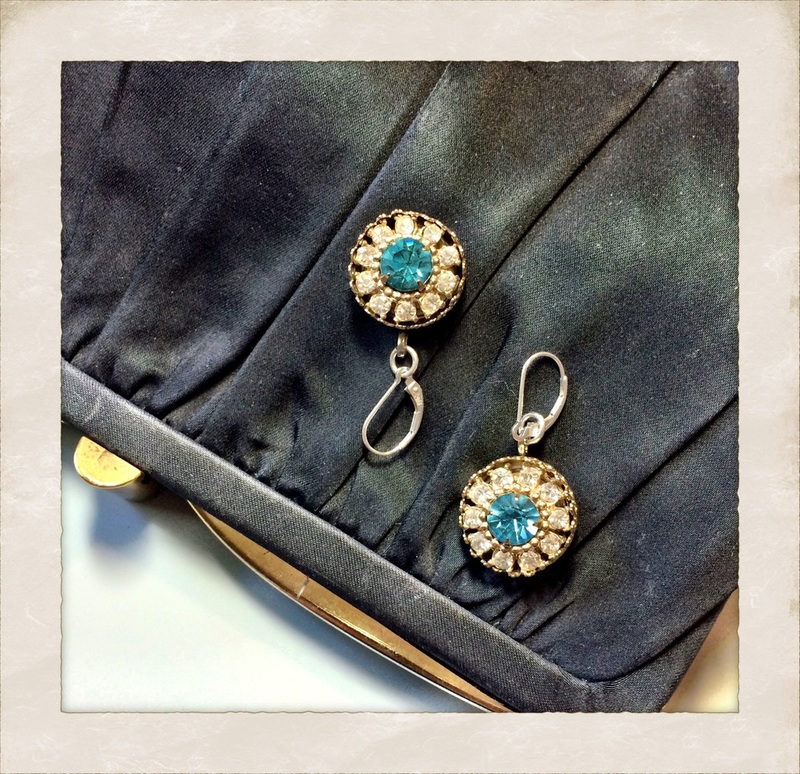 Lovely vintage earrings now have Sterling silver ear wires. Or for some fridge fun...I can create fridge magnets from vintage earrings or brooches. Yes!...even your fridge should look lovely! A large metal daisy brooch is now a striking fridge magnet! I had not created "vintage" pieces in a while, so was very happy to have this market to get me "back" to it! A stunning vintage brooch is paired with a new string of cultured pearls. Wear together or just brooch or just pearls! If you get an opportunity...drop by a vintage market. The unique pieces, colours, textures...all will enthrall you! Don't worry about missing this one...find another...and I know @vintage30 and @cornershopdecor plan on doing more of these markets...so keep an ear out! Fun just to walk down memory lane...although I'm sure something will speak to you and want to continue its tale at your home! 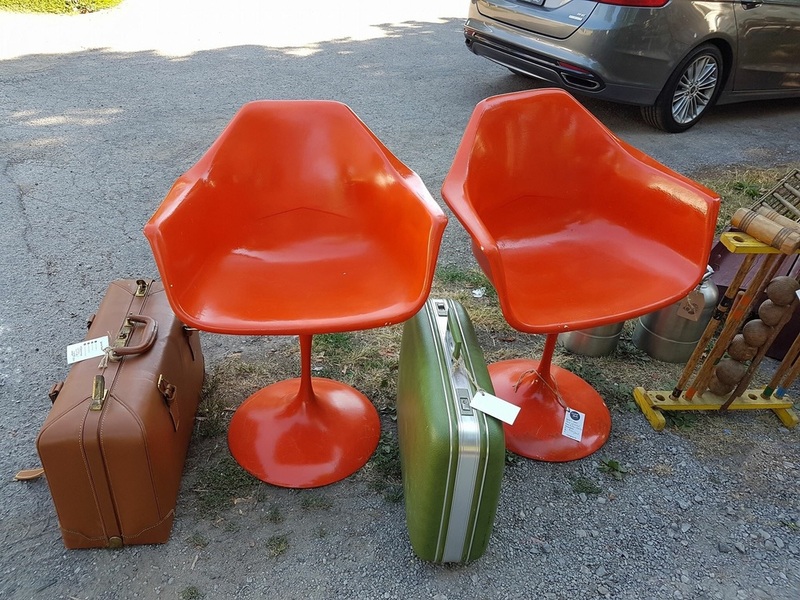 Check out the colour of these fun chairs! !